I think so; after I recover, get my fitness back and get back to practicing. How would you beat them? Better movement? Power? Placement? What do you see as their weaknesses? I think they'd both be pretty tough outs myself for many / most people. I'd say no 4.0 is beating them. 4.5's would be a mixed bag. They'd expose the weaknesses of most 4.5's though I'd say and win many more times than not. 5.0's would beat them. I'm a 4.5 and I think that any 4.5 with above average movement would not struggle against these guys. I love how they play, especially the gentleness, efortlessness of it. If I had always played like them I wouldn't probably have any knee, elbow problems now, and my total unforced error count so far would be 75% less. I wish I had watched videos like this instead of current pros' in the last 5 years since I started playing tennis. I love how they play, especially the gentleness, efortlessness of it. If I had always played like them I wouldn't probably have any knee, elbow problems now, and my total unforced error count so far would be 75% less. I wish I had watched videos like these instead of current pros in the last 5 years since I started playing tennis. I had a look at Connors vs Rosewall, Forest Hills, 1974 and there was your smooth, slice and low-powered game going up against the brute power of Connors. And the guys playing today hit a lot harder with more topspin and RHS. Connors had a lot of easy volleys when he came to net as the return was a slice shot that was popped up. Yes, you can do a lot with slice today in the modern game but you'd better have a decent topspin backhand too when the other guy pounds your backhand and comes to net. I'm getting ready for my first senior tournament in Sept, after 30 years of golf. Nice to see how they play at the National level. In my playing days, the guys that played the most tournaments, were always, a tough match. I'm in a small local one, and have been told the good ones; are steady and can run. I agree but the main point to me is the low powered, relaxed style. That's what impresses me a lot. I would probably win 0-0. They are very good for their age, but the returns are hit from inside the baseline and land over the T. Once they get in trouble they cannot recoup, combine that with a weak return/serve and they will never really be in the point. Once they start having to take 2-3 steps on the return, their age will show, curently its like 1step max. One of the downfalls of being 70. Are you a 5.0 player? Love-Love: Al hits a deep return but and gets one rally ball back but makes an error on non-offensive slice. 15-Love: Brent hits a second serve with spin - you can tell it's well practiced and likely consistent, but it's not offensive enough to push his opponent back. Brent does hit a deep slice to force an error, this is higher quality perhaps above 4.0 level. 30-Love: Good high return by Al and well handled deep forehand but Brent just dumps a junk ball into the net without moving his feet at all. At the 4.5 level I'd have to think the player would have moved to hit a heavy deep forehand and perhaps approached behind it. 30-15: Brent fishing for an error or short ball using his slice to the backhand but got a little too aggressive makes an unforced error of his own. On par with 4.0 that I'm used to. 30-30: Another solid second serve by Brent, reinforces the idea that he's had decades of practice and won't likely breakdown in a match. He really doesn't do much with the return directly to him and gives Al a look at an offensive shot. Ignoring the debate of whether to shot was in or out, the placement, spin and pace of his attacking ball looks representative of 4.0 level to me (good depth, little spin, hits lower tarp on decline of bounce). 40-30: On a well-placed/lucky return Brent smartly slices back. His strategy is sound and execution is good. Al's timing is off, which on that quality of a slice I'd expect to see a 4.0 not be able to hit aggressively on a consistent basis. Love-Love: Al goes straight for a slice down the middle to Brent's backhand. It's obvious that tactics-wise, they're above average 4.0 level because their serves are well refined in strategy and placement (Almost all of Brent's serves in the 1st game were to the backhand), but they just like pop. 15-Love: Second serve able to aim on the backhand side, although I think young faster 4.5+ player could run around and hit punishing forehand. And then rally slices up until Al is forced to approach and Brent hits a nice topspin backhand dipping shot on a relatively deep ball. 15-15: Another well aimed first serve slicing into the backhand body. The short return would typically illicit and heavy and deep approach but the deep slice is probably more comfortable for Al. The winner by Al at the end is potentially a ball a younger 4.0 could get up to and maybe whack a down the line attempt but the overall quality of the point is still high level 4.0 maybe even low 4.5 imo. 30-15: Another well placed serve. Just from these few points it seems like Al has a tendency to not stay low throughout the entire shot when he's hitting topspin drives. Maybe it's a product of his age but it's obvious his shot isn't landing close to the ideal target. And it's really too close to call but it does seem like Brent isn't giving him any benefit of the doubt throughout these close ones. 30-30: Consistent second serve followed up by excellent approach. I have to give Brent credit for his speed here at 70+ but a younger Al would have likely followed his drive a bit quicker so that first volley would have been a finishing smash, instead he has to volley from a bit further out and ideally could have hit a dropper. And same idea with the overhead, perhaps with faster legs he would have caught up and hit a much more aggressive smash instead of being forced to back up to no man's land and then respond to a tough slice. 30-40: Not enough done by Al after a short return and both guys stay pretty consistent in a rally which I'd mark as high 4.0 before Brent his a nice dropper. Overall just seems like these guys could be 4.5 or even higher if they had the mobility and quickness of younger legs. Not once do you really see a full kinetic chain forehand whip, because it really requires a deep knee bend to smack those low slices and these guys most likely can't do that for a full match. But you do see a lot of good tactical habits. Decades of always serving to the backhand has been ingrained, and not once did either guy double fault while still aiming for the backhand side. I'd be able to buy high level 4.0 since these guys will never beat themselves, maybe even taking a set on a low level 4.5 but a full best of 3 match, particularly if outdoors? I'm not so sure. No idea, but was invited to the league (i play for fun now). Would probably play like 3-4, the top guys arent real 5.0's. Older top 200 pro's who teach, but in doubles they are beasts, such great hands. Not sure if my friends elbow got better, but he was playing and had a win over becker in doubles. Mid 40's now but so good at doubles, can bounce balls over the fence off high backhand poaches. Has that effortless flick like the bryans. The problem i stated is the one i have problems with against younger players. They start each point off at such an advantage you are rarely able to do what you want. Just the way it goes. I think that a lot of those errors are due to the power of the racquets that they are using. Being off slightly on the angle and the ball goes wide. It looks like the racquets are great for hitting deep without much effort but I didn't see many sharp angles kept in with topspin. I agree with your comments on stamina - outside in the 90s with high humidity and that could be rough. Most older guys aren't doing 100 miles a week. You're playing juniors that know how to take time away from you - these older guys aren't going to do that. These guys weren't that good on defense either. I saw a couple of wide shots to the backhand that didn't get returned. I think that a lot of those errors are due to the power of the racquets that they are using. Being off slightly on the angle and the ball goes wide. I have a very powerful frame as well, but the power is tamed with topspin. Did you see any rolling angled shots from these two players? I watched the first 3 minutes and I don't see any "weapons" possessed by these old men that would give me troubles!!! They're not even 4-shot consistent. You see them moving but they become out of position fast with short balls and resort to pace-less BH and Forehand slicing. Oh how I love paceless balls! I play with a USTA 3.5 woman and gave her my full doubles court and beat her with ease though. I only watched a few, but didnt see alot of contact outside the singles sidelines. No knock on them, they arent bad players by any means, national lvl speaks for itself. My racket is powerful "and" stiff, it doesnt absorb the top like my older rackets. I have some rf97's, i think they are similar in stiffness to yours, not familiar but think i got right one. This is a much different different racket, especially the open pattern. Blends well but you have to use a poly main and syn cross. Also have to use a big vibrazorb or the string bed is inconsistent. Its a very sensitive racket. Leather grip is a big nono, will kill arm, its a 1pc racket (solid construction, no foam or plastic pallet. Graphice from head to toe). Finally got my receipe and loving them. Keep watching. They made a lot of errors in the first 3 games. Starting from the 4th game Al starts to pick up his game. Consistency improves. Al hits some balls that would trouble almost players on this board. Al’s weapon is his placement and control. He hit a lot of innocuous looking balls that put Brent on the defensive due to the placement. So many people watch the Brian Su video and think, “he doesn’t do anything special.” I guarantee you, he’d beat most all of the posters on the board with his ordinary looking game. Are you talking about this Brian Su? Brian's playing level is clearly different and higher than the old men above. His strokes look all controlled and the placement is well intended and executed. But I wasn't talking about Brian Su. The old men's hitting forms are very wobbly which explain their lack of consistent. The points that stay a bit longer are those hit well in the middle and soft. Scroll to a random point in time, 12:25, and see. They look active but why do they slice on both wings a lot? He does alot of things special. A very smart player in reguards to shot selection. Even mixes in the floater slice. His defense is loopy top that lands deep. I like watching him play (havent seen much). In the video above i like how he hit a def loopy return, followed by a flat fh. Much different timings and bounce, rarely gives you the same shot twice (hard to play against). These guys are trickey, you have to hit 2 great shots to win the pt. But you have to know the first one is good enough to set up the 2nd. For example if the black shirt guy knew the return would be played defensive and s&v, it would of ended it quickly. But the serve has to be good enough to produce that result. Takes a great player to do these things enough times to win a match. Scroll to the 7 min mark when the score is 2 all and watch the the next 4 mins when the score is 5-2 in favor of Al. I don’t see any wobbly play. I see Al playing aggressively and placing the ball in spots making Brent uncomfortable. Brent realizes this and tries to do more with his shots and overplaying which results in more errors on his part. Of course Brian’s playing level is higher. He was in his early 40s in that video whereas the old guys are nearly 2x that age in the 70s. It’s like comparing present day Safin or Santoro to present day Laver. Of course Brian’s playing level is higher. He was in his early 40s in that video whereas the old guys are nearly 2x that age in the 70s. Foreward movement was very impressive. Drop shot is a weapon in this class, like the no mans land volley in the 90's. I like Al's serve. He starts with the racquet already in position. I've seen some very good players on youtube do this. It's not very aesthetic, but practical. A short backswing that can still supply decent power. You know how they say the camera adds ten pounds? It also makes great tennis look meh. Chris Evert and Tracy Austin look like club players on video. But in reality, even big hitter males would get destroyed by their depth, pace, and consistency. I play a number of people in their 60s and 70s and all of them use techniques of different bounce and timing to gain an advantage. If you haven't learned how to use tactics and variety to disrupt the other player, then you have been learning and growing over the decades. One of the guys that I hit with started doing this stuff about 25 years ago. It would rattle me. High, low, deep, short, side-to-side, slice, topspin, surprise serve and volley and then developing a complete set of left-handed strokes as well as one-and two-handed backhands, both lefty and righty. So I'm quite used to this stuff after seeing it for so long. And you develop a lot of patience over the years in practices. This is why I don't mind hitting with or playing against pushers. I just have a lot of patience. 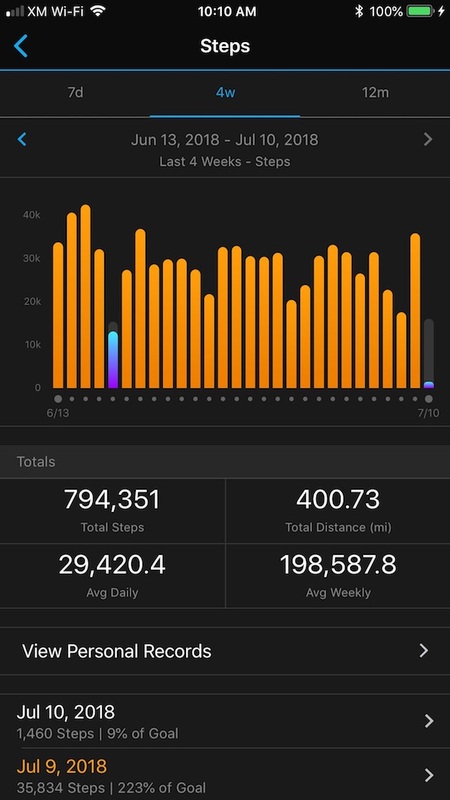 I posted the image of doing 400 miles this past month. Anyone else here doing that kind of mileage? Do you think that the two older guys are doing that kind of mileage? How about these guys? When the age is 10 years lower, the speed and footwork improves significantly. Too bad we're all getting old! Video is not edited but fast forward with arrow keys work well. Better technique and fitness from these two guys. The guy in the forecourt in the beginning looks like he does regular weight-training. He's also not afraid to really move and accelerate for balls. You worry about lower joint issues when you're older and may hold back on going for shots for fear of injury. I dove for a shot back in my mid-40s. I wound up with a sprained wrist, bruised chest, cuts on my forehead and legs. I cleaned myself up in the bathroom and finished out the set. The pain hit me when I got in my car and I drove to the pharmacy to buy a couple of things to deal with the injuries. I then decided that diving for a ball wasn't a good idea in my 40s. I see more and more older folks in fantastic shape. There's a lady I know that was a national class runner in college and she was doing about 40 marathons a year. She was also sponsored by two of the running footwear and apparel companies. Our fitness center manager is only in her forties but she was a national class cyclist in college and she took a week off to do four races. I can say that you don't need to slow down in your fifties is you put in the time in the gym and maybe on the road. I'll let you know about the sixties if I make it there. Lets give Bret and Al some respect. Or do you only play in your own little 4.0, or 4.5 box, because you might win more than 50% of your matches. If you have not lost one and one, you need to play better players. But please understand that there are realistic declines with age. I don't think that anyone else in this thread understands that more than I do. I posted the image of doing 400 miles this past month. Anyone else here doing that kind of mileage? Do you think that the two older guys are doing that kind of mileage? I'm fairly new to tennis, but everything I've been reading tends to agree that long distance running doesn't provide much benefit to tennis endurance. Although, if your perspective is that it takes patience and a very strong mental fortitude to run that far - I'd have to agree. Running long distance take patience, planning, and strategic and tactical thinking. The thing is that the vast majority in the US are quite out of shape and couldn't even run a few miles; and that probably includes most tennis players. I have a 5.0 friend and he's about 40 pounds overweight. But he plays a style that maximizes the assets and minimizes the liabilities. That means shorter points and first-strike tennis. If running doesn't provide much of a benefit to tennis endurance, why does David Ferrar run for an hour a day? His style of tennis is brutal, attrition - type tennis. Knowing that you can stay out there all day long and run down ball after ball after ball weighs on your opponent unless your name is Federer, Nadal, Murray or Djokovic. Even before the match starts. If running doesn't provide much of a benefit to tennis endurance, why does David Ferrar run for an hour a day? I'm really out of shape, running long distance would definitely help my endurance level. I'm just not sure if it would help my endurance level for tennis more than doing sprints, according to what I've been reading. I'm definitely not an expert on the matter . Irrelevant. Brent Abel was a pro player. If you're seriously out of shape, I wouldn't start with sprints. They put heavy acceleration forces on your lower joints and those joints and the rest of your body may not be up to the task of that kind of work. I haven't done sprints for about two years and I usually did this on a track because you ideally don't want to have to deal with uneven surfaces, objects, people, animals, etc. Treadmills usually only go up to 10 MPH and pressing the buttons to accelerate or decelerate can be dangerous at high speeds on a fairly short platform. I'd get the joints accustomed to higher stress levels with slower running or other movements that stress the joints but in a gradually increasing way. Did you see the Isner thread from 2006? A poster thought he was a hacker back then. I I posted the image of doing 400 miles this past month. Anyone else here doing that kind of mileage? You do 13.5 miles a day everyday? Wow!! What has that got to do with Brent Abel having been a pro player and a coach? Point is he is not a fair comparison for rec players. My office looks like a shoe store. My feet and toes, in particular, look like they've been beaten and are all kinds of shades of black and blue and sometimes red. Rod Laver was a pro player as well. Did you see him hitting a few balls with Federer last year or the year before? Do you think that you could beat Laver in his current physical condition? That's the point. I'm really asking if younger / faster, but less experienced / less skilled players will beat players with this much experience but older. It seems to me that we have differences of opinion (as I expected). I'm of the opinion that their experience and their "ability to win" would prevail much of the time. The video is deliberately deceptive. It's two skilled players. If we put Brent against a 4.0 TT poster, we'd see a much different match. I don't know. I saw Laver last year when I was helping out at his charity and he did not play any match - just gave lessons. I was told that he doesn't play anymore due to movement issues. Last time I saw him play was on TV during the IHOF ceremeny several years back. He played doubles for a short while and could barely move, though his strokes, if he got to the ball, were very accurate. After a certain age, generalities are not valid. For example, Laver had a stroke (no pun) and had to relearn tennis by teaching his grand-daughter, and then of course things cam back to him very fast. It would be stupid to ask whether a 4.0 player could beat him during the recovery stage. Actually, continuing with the previous post, several pro doubles players of an advanced age were playing at Laver's charity. I was in charge of putting placards on the fences. Frankly, I have seen many club doubles better than that. The difference was what they COULD do. They could spin the ball in on the serve with a lot of action. They could hit laser sharp volleys. If you don't focus on those, and instead look at the majority of strokes which they could not reach or goofed up, you would say it was 4.0 level or lower. The key is what they CAN do, once in while. Rec players CANNOT do that. It is like Karlovic's serve - he loses, but Fed and Nadal cannot do what he does. Toby is an acquaintance of mine and we've made half-hearted efforts to get together and play but it hasn't happened yet. He's a member at Mission Hills so I'd like to get out there and play with him on clay and then grass this fall. We'll see. Anyhow, the closest I can get to answering this question is that a few months ago I played two practice sets with a guy who's beaten both Toby and Doug. He got to #3 in the O60s ITF rankings last year (take that with a grain a salt). We split sets... I believe it was something like 4-6 7-5 or thereabouts. (I would expect him to beat me more often than not.) Of course, I'm 10+ years younger than these guys. Very few of these top guys really punish the ball (a few of the elite guys in the age group do), but they all seem to be solid in the same ways, so it just comes down to movement, fitness and strategy.